This week’s CometWatch entry is a double feature, with two images of Comet 67P/Churyumov-Gerasimenko from Rosetta’s NAVCAM taken on 31 August and 11 September 2016, when the spacecraft was 8.8 and 9.8 km, respectively, from the centre of the comet nucleus. The 31 August image provides a dramatic view on the steep slopes of the Hathor region, on the small comet lobe. Hathor consists of a 900-m high cliff sloping down towards the comet’s neck, and is characterised by marked linear features, streaks and even small terraces. A hint of the dust-covered Ma’at region can be seen towards the right edge of the frame; Rosetta’s landing site, on Ma’at, is beyond the right frame of the image. 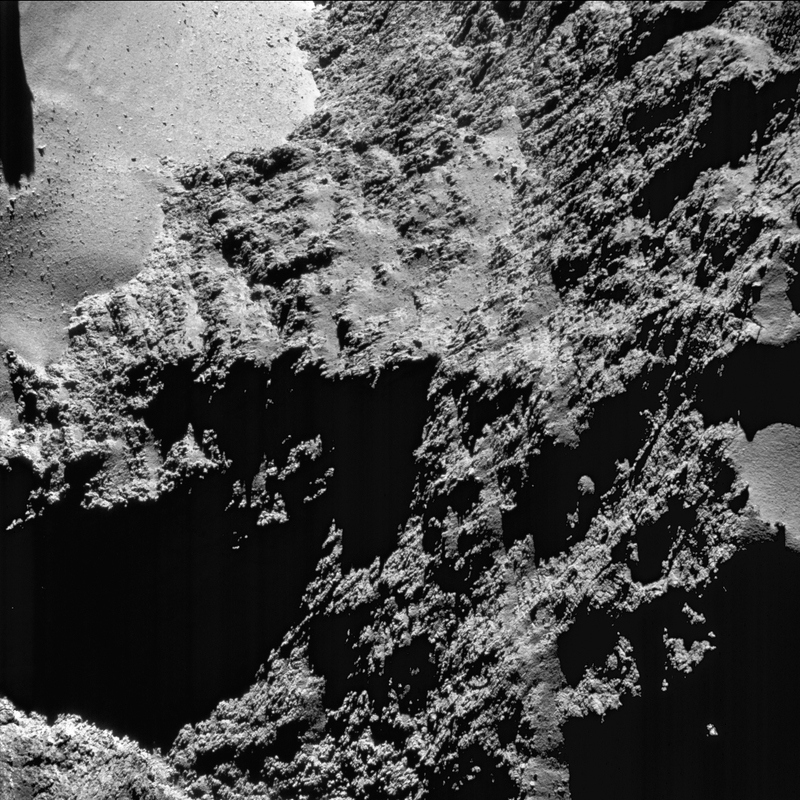 In the top left corner, a portion of the smooth terrains of Hapi is also visible: located on the comet’s neck, Hapi is covered in dusty material and punctuated with boulders. Will there be an opportunity to capture images of Philae during the final stages of Rosetta’s descent ? Comet 67P is one of the members belongs to Juniper family. I wonder if there will be more members being discovered in near future. I’ve read the most recent news about Rosetta to crash into Comet 67P on September 30 after 12-year space mission. Not sure if this is really going to happen. Hopefully this incident can be avoided. Yes, this is how the mission will end, but it’s no incident – the plan is to descend to the comet’s surface. Thanks for sharing the mission FAQ. It’s really useful.